As a Gunmaker, I'm more concerned about the age of a stock blank than the moisture content. Here in the Sierra foothills, the humidity is rather low. It is not unusual for a 2-3/4 inch thick blank to register a moisture content of 8-12% in a mere 6 to 8 months of drying time. Would I dare to use a blank at this stage? No way! But why not? The meter says it is dry. First of all, most moisture meters will only read to a depth of approximately 1". 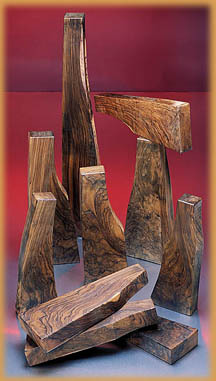 But, just as important if not more, the wood has not de-stressed or stabilized. This de-stressing is something only time can accomplish. In my opinion, 30 months from the cut date is minimum aging time. Unfortunately, there is a lot of wood being sold as ready that is probably only a year or so old - far too immature for carving. Use of one of these immature blanks can result in an unstable stock, inletting which "opens up" leaving unsightly gaps, and other problems. If you're unsure of a blank's age, date it and set it aside for future use. Many of the blanks we now have in stock were cut in May of 1999. The selection is very, very good. We do have aged blanks in stock. Be sure to specify. We have a rather complex grading system, but I feel it gives us a more consistent way to judge each blank. Here's what we consider when looking at a stock blank. Layout It has to be correct to get top points. Warpage Some is inevitable, but it can't affect final product..
Sap Will be downgraded if it affects final product. and the other average, of course the blank will be downgraded. Size Undersized blanks will be downgraded. After being graded on the above criteria, each blank is evaluated for the amount of stripe, fiddleback, marble, feather crotch and contrast. A premuim may be added to exceptional blanks. 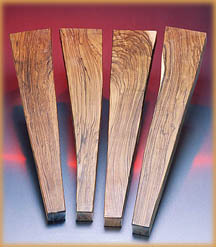 We do not place a greater value on quartersawn blanks or slabsawn blanks - we leave that to our clients. Some matched sets are in stock. 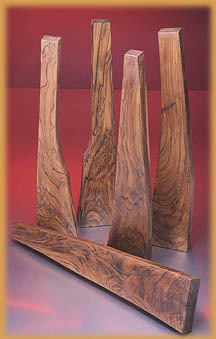 Bastogne blanks from $400 - $1850 each. California English Blanks from $300 - $7500 each. Approximately 1,500 blanks in stock. All are medium to very high grade. We sell NO low grade wood. Very good selections in the $400-$1500 price range. Discounts for multiple blank purchases. Please contact us and we can email photos of our wood based on your requirements.